The rain we've had the past few days has given me a break from working in the garden. While the skies drip I've been stitching and felting in my little workroom. I've finished some work that will be in the next shop update (coming soon) and have started on my next edition for the Art-o-mat. Rumor has it that they're completely out of my work. I got an email the other day from Colleen letting me know that while she was visiting the Smithsonian, she checked the Art-o-mat there. The machine was being re-stocked at the time and although they did have my stones, they were out. She was sweet enough to snap this pic for me though and send it to me. I was thinking, since many of us don't live near an Art-o-mat, I would offer up a very limited edition of small pebbles in my shop today. I'll put up a total of 10, five this morning, and five later this evening. They'll be a surprise, just as if you were kerplunking them out of the Art-o-mat, and will be in these little muslin bags. These are smaller versions of my stones, all around an inch or so long. Anyway, I hope you find it fun. And can I ask if you would only purchase one, so more people get a chance at them? Thank you all. Have a wonderful day. At last I grabbed one, oh my I am so happy!And I am sharing on facebook! I am a good girl and only bought one!ok!AriadnefromGreece! I have two of your larger stones and adore them! Please give a heads up this evening when the other little ones go up! :) Your work makes me so happy! you really do deserve to be in a museum but not stuffed of course . 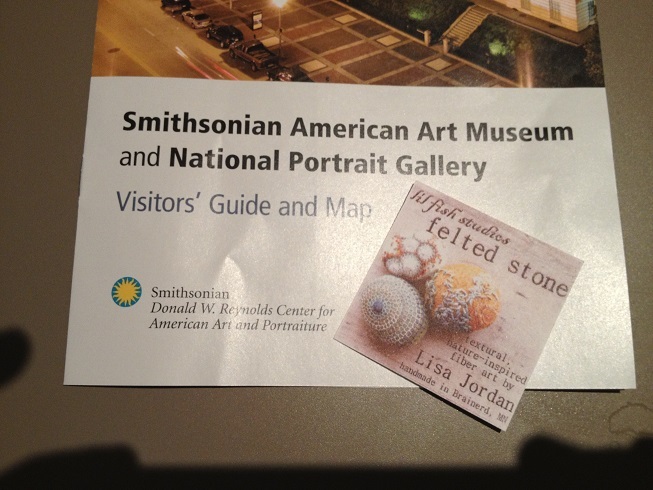 Wow - I love that you're in the Smithsonian, fantastic! What a sweet idea to offer these online, you're the best. Grrrr!!! I was in Spain and a bit disconnected from the online world, and this opportunity came and went. Grrrr again!! !